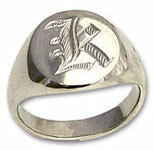 Platinum signet ring with hand engraved letter "K" initial. Style #2, available in 14 and 18 Karat gold as well. Face size 13 x 15 mm.oval.